Saut d'Eau Haiti - Four pilgrims (Vodouisants) died in Saut D'eau earlier this weekend when a boulder fell on them on the peak day of a three-day Vodou festival, news reports say. According various news reports, the pilgrims were under the waterfall at the sacred site of Saut d'Eau when a boulder came tumbling down, killing them. 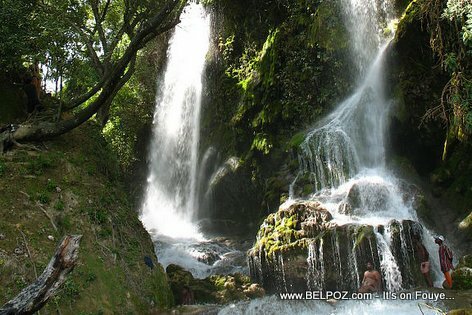 Every year from July 14 to July 16, Haitians gather at the sacred waterfall, Saut d'Eau, near Mirebalais Haiti, to celebrate "fete Vierge Micacle Saut d'Eau", a religious pilgrimage commemorating the appearance of the Virgin Mary of Mount Carmel in that spot. Every year, Pilgrims go to Seau d'Eau to ask favors from The Virgin Mary, if you are catholic, and from Erzulie Dantor if you are is a Vodouisant. You are right, I was not replying to you directly. I was referring to this message. "Every year from July 14 to July 16, Haitians gather at the sacred waterfall, Saut d'Eau, near Mirebalais Haiti, to celebrate "fete Vierge Micacle Saut d'Eau", a religious pilgrimage commemorating the appearance of the Virgin Mary of Mount Carmel in that spot." I do not think that JB replies to me whatsoever because I didn't say anything abut Virgin Mary .Maybe He was adressing to the person who wrote the article .the only thing, I feel sorry for the decease and I did sent my condoleances to their families. JESUS IS COMING SOON! Haitien adore zidol trop, se pou sa nou pa ka avanse. What does the Virgin Mary has to do with Voodoo? My heart goes out to those and their families who died in this terrible accident. I do not want to forget our great musicien AZOR who also passed away.